SALEM NEWS: Oceanographic surveyors of the sea floor in the area of the Bermuda Triangle and the North Sea region between continental Europe and Great Britain have discovered significant quantities of methane hydrates and older eruption sites. According to two research scientists the mystery of vanished ships and airplanes in the region dubbed "The Bermuda Triangle" has been solved. 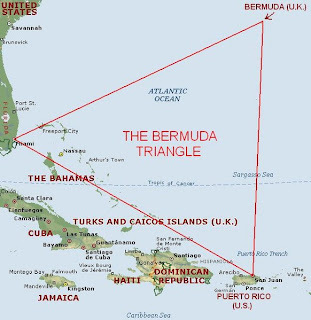 Step aside outer space aliens, time anomalies, submerged giant Atlantean pyramids and bizarre meteorological phenomena ... the "Triangle" simply suffers from an acute case of gas. The evidence for this astounding new insight into a mystery that's bedeviled the world is laid out in a research paper published in the American Journal of Physics. Researcher Ivan T. Sanderson identified these mystery areas during the 1960s. Sanderson described the actual shape of these regions as more like a lozenge rather than a triangle. 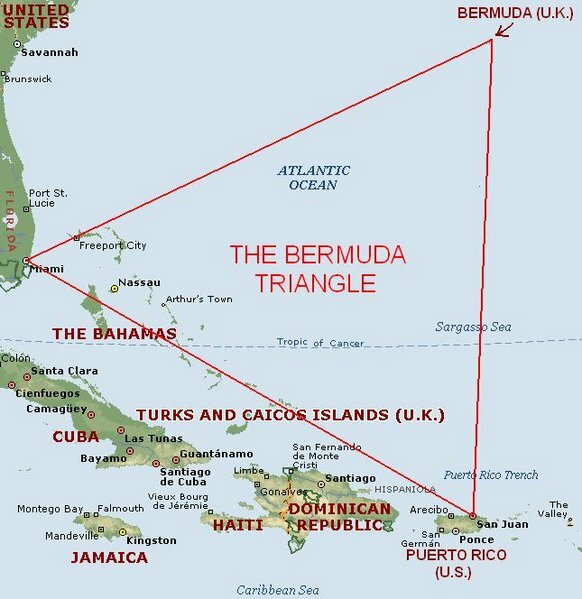 Some of the more famous spots include an area in the Sea of Japan, the North Sea, and of course the infamous "Bermuda (or Devil's) Triangle."